A Hubble Space Telescope image of elliptical galaxy NGC 4889, in front of hundreds of background galaxies. NGC 4889 hosts a hidden supermassive black hole. An ordinary galaxy hosts an enormous, hidden black hole in a new Hubble view. 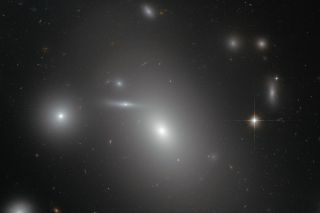 The newfound supermassive black hole embedded in the elliptical galaxy NGC 4889, as shown in a new video, is one of the biggest ever discovered at 21 billion times the mass of the sun. Its strong, inescapable gravitational pull has an event horizon 15 times the diameter of Neptune's orbit —an incredible 81 billion miles (130 billion kilometers) in diameter. "But the time when NGC 4889's black hole was swallowing stars and devouring dust is past," the Hubble European Space Agency Information Centre said in a statement. "Astronomers believe that the gigantic black hole has stopped feeding, and is currently resting after feasting on NGC 4889’s cosmic cuisine," they added. "The environment within the galaxy is now so peaceful that stars are forming from its remaining gas and orbiting undisturbed around the black hole." The black hole used to be fueled by galactic material such as gas and dust, which fell inward and created a spinning disk of material known as an accretion disc. The black hole's strong gravity accelerated the material and heated it to millions of degrees, with the material sending out huge jets. These jets and energy would have made the galaxy system a quasar, one of the brightest celestial objects in the universe. At that time, it would have sent out energy up to 1,000 times stronger than what we see from the Milky Way. Although the material is now gone, NGC 4889 still is a useful object for astronomers to better understand the evolution of quasars. The huge mass of the black hole was determined using instruments on two ground-based telescopes: the Keck II Observatory and the Gemini North Telescope. Astronomers measured how fast stars move around NGC 4889. Since their velocity depends on the mass of the object they orbit, this revealed the mass of supermassive black hole. Editor's Note: This article was updated to reflect the total mass of the newly-discovered black hole.